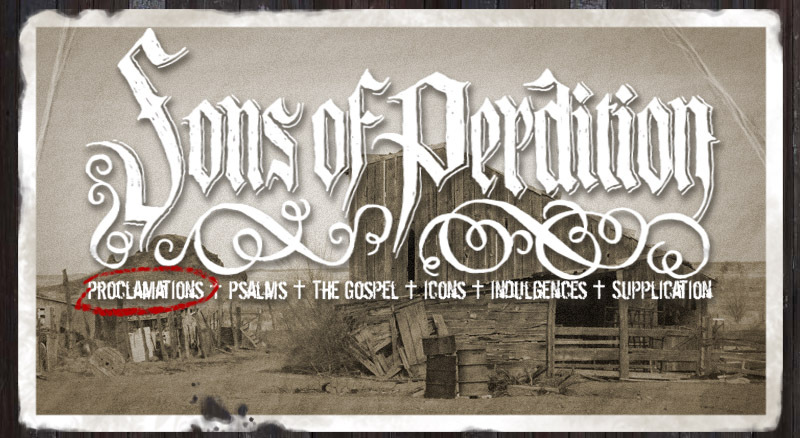 After much toil and blood loss, I can say that our website, http://www.sonsofperdition.com, is at long last open for your scorn and adulation. Within its dusty pages, you'll find a bit more information about your not-quite-beloved Sons than you probably care to know. In addition, I've posted the lyrics to "The Kingdom is on Fire", random words and some artwork. The lyrics for our upcoming album, "Psalms for the Spiritually Dead", will be posted once the release of that most sacred record is upon us. Such a bounty of holy knowledge and woe hasn't been freed upon the earth since the Holy Bible was first translated from Latin so that the people could read the miserable news for themselves. I'll do my best to keep the site a bit more updated than I've kept our MySpace site, where news admittedly came in fits and starts. This oughtta be easy enough to do, since there's a decent amount of goings-on within the band lately. We're currently practicing so that we can start playing some shows around Arkansas, Texas, Missouri, Oklahoma, Kansas and possibly East Germany. The other 45 states (and West Germany) are currently out of luck, but I'm sure we'll get around to them eventually. We've also got the new album coming out sometime later this year, as well as a couple of other side projects. And there are always more deserted towns for me to brood and obsess over, then pour the stories of their death into your waiting ear like a secret, lurid promise during Sunday sermon. So take some of your precious time to pore over the smudged ink of our hymnal. Consider your time spent as a tithe. Smell the rotting paper, the heavy tones of sacramental wine. Hear the timbers sagging as the house of the LORD exhales its cloying breath through shuttered teeth. And ponder the sorrow of psalm and the mysteries of the word with us.